Reviving an old tradition, a group of citizens who support the efforts of the NOPD Second District publicly awarded a number of officers for their crime-fighting efforts this month. 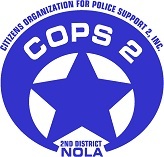 COPS 2 (Citizens’ Organization for Police Support 2) traditionally raises money through private donations and the annual Magazine Street Blues Festival to fill in the gaps between the Second District’s needs and the city budget. The organization has replaced furniture and computers in the district’s aging station house, and also provides meals for the officers during major deployments such as Mardi Gras. In years past, COPS 2 would also name an officer of the month in the district, and present that individual with a cash award at the district’s monthly meeting with community members. The organization also has quarterly and annual Tommy Parker awards, named for one of the group’s founding members. Last week, that tradition was revived by Second District Commander Paul Noel — and the organization actually had several months’ worth of catching up to do during the gap in leadership in the Second District. Detective: Sgt. Ron Dassel, a task force supervisor. “He demands nothing but the best from his unit,” Noel said, noting Dassel’s keen attention to crime trends in the district and proactive assignment of his officers to trouble spots. Detective: Sgt. Warren Keller, supervisor of the property crimes unit. Keller was not present at the ceremony. Patrol officer: Kevin Wheeler and Juan Vara. In the fourth quarter, their many arrests included nine drug cases and two gun cases, Noel said. October 2011: Detectives Jerry Baldwin and Charles Augustus. In October, Baldwin and Augustus were instrumental in the arrest of Trebor Blanton, who is accused in a string of robberies at knifepoint around the Carrollton area. November 2011: Sgt. Miroslav Brekalo. Brekalo, who has since been promoted out of the district, was assigned to the district’s pro-active patrol car and was a consistent leader in drunk-driving arrests. December 2011: Officers Kevin Wheeler and Juan Vara. Wheeler and Vara stopped a man who was discovered to have a pawn ticket for a stolen $250,000 ring. January 2012: Detectives Christian Varnado and Jerry Baldwin. Varnado and Baldwin were involved in the arrests of multiple robbery suspects in January. February 2012: Detectives Michael Lorio and James Cunningham, two narcotics officers who played a key role in the shut down of Big Time Tips bar. The awards are supported by a grant from the Azby Fund, but most of the work done by COPS 2 is funded by its memberships, said Trish Clay, president of COPS 2. She urged the residents attending the community meeting to visit the COPS 2 website, http://cops2.org, and consider becoming a member. “It’s a way to be a positive part of the community,” Clay said.